With regards to the alleged public threats uttered against the Jews by the National Socialists, Prof. Arthur Butz pointed out many years ago that the National Socialists were addicted to violent language, and that words like “ausrotten” need not imply killing. In my own translation of the so-called Himmler “secret speech”, I pointed out that many exceedingly violent-sounding German words can be used in entirely figurative ways, i.e., the extirpation (“ausrottung”) of laziness. Hitler’s speech of July 13, 1934, immediately following the Röhm Putsch, contains one of the most extraordinary examples of the violent language used figuratively that I have ever seen. After a very long discusson of degenerate cultural influences, Hitler says, “Der Nationalsozialistische Staat ist aber bereit, in seinem Inneren, wenn nötig, in einem hundertjährigen Krieg, die letzten Reste dieser Volksvernarrung and Volksvergiftung auszurotten und zu vernichten“. Literal translation: “But the National Socialist state is prepared, domestically, if necessary, in a one hundred years’ war, to extirpate and destroy the last vestiges of this mass-cretinization and mass-poisoning ”. Now. This single sentence contains at least three violent-sounding words used in an entirely figurative sense: “war” (a “hundred-years’ war”, no less, but only domestically, mind you); “extirpate” ("ausrotten", often translated as "exterminate", depending on the context and meaning); and, finally, "vernichten" (“destroy”). Note that the direct object of this extraordinary threat is the “last vestiges” of “this mass-cretinization” and “mass-poisoning”, i.e., a whole series of purely abstract terms. So the question arises, to whom, or to what, does this extraordinary threat actually refer? Well, as is very often the case, it is not very clear, but if I were to transcribe and translate at least three lengthy and highly complex paragraphs preceding this threat, it would appear that the “last vestiges” are the "last traces" of Marxism or Marxists (it is not absolutely certain whether this refers to people; more likely to the philosophy they represent, without which the people would be harmless); and that “mass-cretizination” and “mass-poisoning” refers to Marxism (together with, it must be admitted, all sorts of references to “individualistic philosophies of mass decomposition”, anarchistic tendencies, and so on and so forth). There is no mention of Jews, anywhere in the entire speech. Again, this also fairly common with Hitler. In other words, this extraordinary example of violent, but figurative language, is simply a threat to continue to repress Marxism in a country in which Marxism was more or less a spent force. It should be noted that when Hitler did mean“kill”, he was not shy about saying so. For example, with reference to the plotters of the Röhm Putsch, for example, he says, “ein sicherer Tod sein Los sein wird” [“a certain death will be their fate”], and “solche Männer lasse ich totschiessen” [“I’ll have such men shot dead”]. The word “war” was also used figuratively by the National Socialists, at least occasionally. 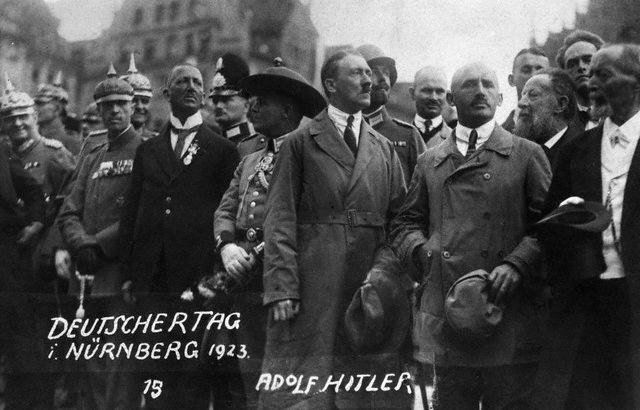 In one of his other speeches, Hitler speaks of the “war for power”, although this is very unusual; usually, he refers to the “struggle for power”, since it was purely political and he was legally elected. I know of no actual threat to kill Jews, made anywhere, ever, by any German National Socialist. The threats, when boiled down, all consist of abstract stuff like this. The closest you come to any actual suggestions of killing may be found in the writings of Julius Streicher, who spent the war in confinement on his farm, in total isolation, under constant watch by the Gestapo. Streicher never occupied any significant position in government. Even in Streicher's case, it should be noted that the closest Streicher ever came to advocating the murder of Jews was in comparing them to bedbugs, lice, fleas and various other types of vermin. In a purely literal sense, it is perfectly true that even Streicher never advocated killing anyone. "'All of the Palestinians must be killed; men, women, infants, and even their beasts.' This was the religious opinion issued one week ago by Rabbi Yisrael Rosen, director of the Tsomet Institute, a long-established religious institute attended by students and soldiers in the Israeli settlements of the West Bank. In an article published by numerous religious Israeli newspapers two weeks ago and run by the liberal Haaretz on 26 March, Rosen asserted that there is evidence in the Torah to justify this stand. Rosen, an authority able to issue religious opinions for Jews, wrote that Palestinians are like the nation of Amalekites that attacked the Israelite tribes on their way to Jerusalem after they had fled from Egypt under the leadership of Moses. He wrote that the Lord sent down in the Torah a ruling that allowed the Jews to kill the Amalekites, and that this ruling is known in Jewish jurisprudence. "Rosen's article, which created a lot of noise in Israel, included the text of the ruling in the Torah: 'Annihilate the Amalekites from the beginning to the end. Kill them and wrest them from their possessions. Show them no mercy. Kill continuously, one after the other. Leave no child, plant, or tree. Kill their beasts, from camels to donkeys.' Rosen adds that the Amalekites are not a particular race or religion, but rather all those who hate the Jews for religious or national motives. Rosen goes as far as saying that the 'Amalekites will remain as long as there are Jews. In every age Amalekites will surface from other races to attack the Jews, and thus the war against them must be global.' He urges application of the 'Amalekites ruling' and says that the Jews must undertake to implement it in all eras because it is a 'divine commandment'. "Rosen does not hesitate to define the 'Amalekites of this age' as the Palestinians. He writes, 'those who kill students as they recite the Torah, and fire missiles on the city of Siderot, spread terror in the hearts of men and women. Those who dance over blood are the Amalekites, and we must respond with counter-hatred. We must uproot any trace of humanitarianism in dealing with them so that we emerge victorious.'" "The true outrage is that most of those authorised to issue Jewish religious opinions support the view of Rabbi Rosen, as confirmed by Haaretz newspaper. At the head of those supporting his opinion is Rabbi Mordechai Eliyahu, the leading religious authority in Israel's religious national current, and former chief Eastern rabbi for Israel. Rosen's opinion also has the support of Rabbi Dov Lior, president of the Council of Rabbis of Judea and Samaria (the West Bank), and Rabbi Shmuel Eliyahu, the chief rabbi of Safed and a candidate for the post of chief rabbi of Israel. A number of political leaders in Israel have also shown enthusiasm for the opinion, including Ori Lubiansky, head of the Jerusalem municipality...."